Bo Ningen release new single ‘Kaifuku’ via Stolen Recordings on September 8th. ‘Kaifuku’ is taken from their third album ‘III’. In what is fast becoming a breakthrough year for the group, following spectacular reaction to their debut shows in the States earlier this year and a series of breath-taking festival appearances including supporting Black Sabbath in Hyde Park, they will soon return to the US in September for a coast to coast tour with Kasabian. ‘III’ is a rich and accomplished album that has seen Bo Ningen evolve musically. Jehnny Beth of Savages guests on the album and they’ve sung partly in English on this album for the first time. It was recorded over several months with the band able to spend more time on the production and development of the songs than ever before. ‘III’ illustrates Bo Ningen as a group with a singular vision, reaching for what they define as ‘pure music’, by turns esoteric and a no holds barred sensory assault. Bo Ningen and Savages announce a collaborative recording as a co-release by Stolen Recordings / Pop Noire Records on November 17th. ‘Words To The Blind’ comprises of one 37-minutes long track. 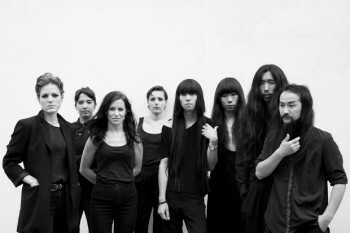 Taking their cross fertilisation a step further, following occasional live appearances together and Savages’ Jehnny Beth guesting on Bo Ningen’s current album ‘III’, ‘Words To The Blind’ is an astonishing piece of work, a ‘simultaneous sonic poem’ inspired by the Dadaist concept of the ‘Simultaneous Poem’. “Zurich in 1916 and Hugo Ball is instrumental in creating the Cabaret Voltaire – a club which will become central to the performances of the Dada movement, during which the artists would experiment with forms of sound poetry and simultaneous poetry. A movement created through the horror of World War One, it attempts to understand how society has reached such an illogical decision. Through simultaneous poetry begins the attempt to delve into chaos and maelstrom, to find the voice of the individual struggling to be heard. London in 2012 and Savages are recording the debut album ‘Silence Yourself’, in a secluded studio in the North West of the city. In the middle of an intense three weeks, we set out one evening to see the band Bo Ningen play at Cafe Oto. A few days later producer Johnny Hostile begins to muse over the possibility of two bands playing in the same space at the same time. Concurrently I am reading about the performances at the Cabaret Voltaire. We decide to approach Bo Ningen with the idea of collaborating on a ‘Sonic Simultaneous Poem’. As the idea begins to take shape in early 2013, we prepare for both bands to rehearse together in a studio with a loose composition based around five chapters. As the musicians of both bands consider how to apply themselves with their instruments to each chapter – revolving, colliding and intertwining with words sang in Japanese, French and English by Taigen and Jehn – we also envisage the physical space in which to perform.